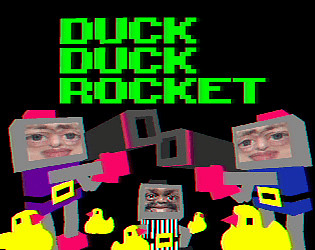 2 player split screen rocket duck deathmatch. Bwahhhhhhhaahhhhahhh. Love IT!!!!! Twitch FPS on an arcade machine awesome. The only issues it only lasts 30 seconds... if you survive that long. Agree with everyone else, would be super fun if there was a period where you could find cover before being able to fire. Otherwise, I think it's a really neat idea. The game starts up WAY too abruptly to get into cover before blowing each other to bits. But a very nice-looking game with potential nonetheless! The graphics/style for this is incredible. I thought that the ability to explode the ref was a nice touch! I agree with the other feedback that the two players start too close together and are always locked onto each other. Great. But, as Jackalope said, having both players facing the opponent all the time kills it. Maybe would be better use the 'right' and 'left' keys to turn and 'up' to walk forward (DOOM-like controls) but this is just my opinion. Nice entry anyway. I loved the weirdness on this one.